Cowboy Cookies | wanna come with? This is my second “cowboy cookie” recipe and I think I now have a better understanding of what a “cowboy cookie” is. The first time I made them I had no idea what they were. How are they different from kitchen sink cookies? Do they always contain certain ingredients? 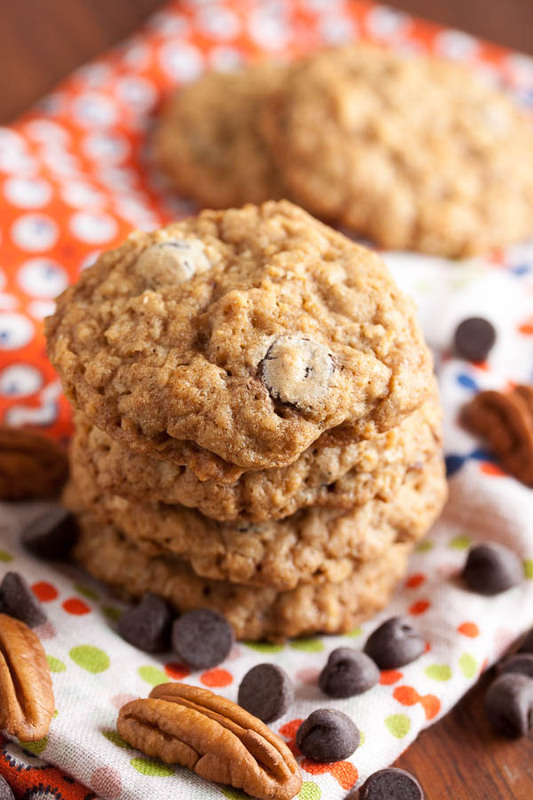 I’ve done a bit of reading since then and apparently a cowboy cookie is a dense, chewy oatmeal cookie that’s also loaded with other ingredients – typically coconut, pecans and chocolate chips. Does that sound right to everyone? And what do you know, this cookie has all of those things. I was totally planning to make some roll-out cookies and use some of my lovely cookie cutters that don’t see nearly enough action, but the rain worked its magic and all I wanted to do was curl up on the couch and watch Netflix instead (if you’re curious, I watched What We Do in the Shadows – great movie!). So instead, I was aiming for a quick cookie. A comfort cookie. 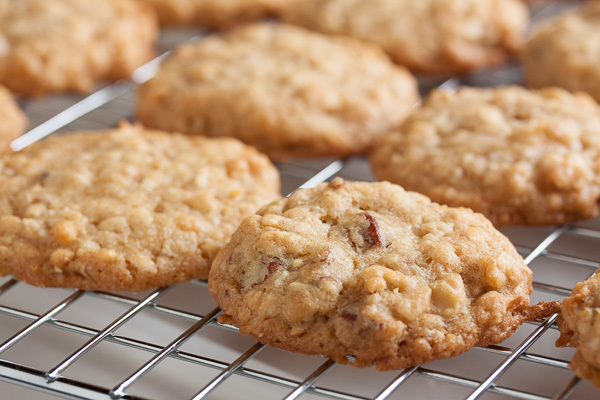 I was leaning towards something peanut buttery, but then I saw this recipe. 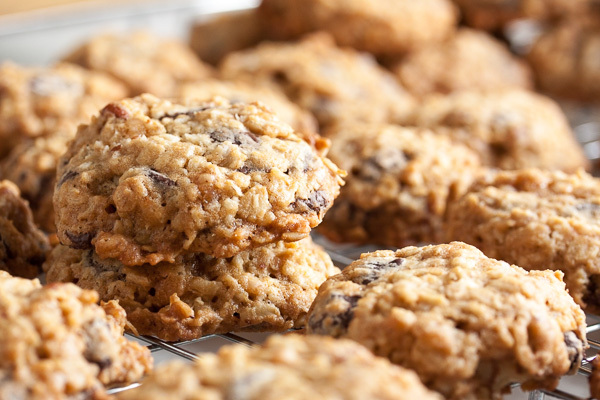 This is one of those cookies that are best when they’re slightly underbaked – it’s a great, chewy oatmeal cookie, with the flavour of coconut, plus chocolate chips and crunchy toasted pecans. Actually, I’m gonna go out on a limb and say that this may be my favourite oatmeal cookie to date. 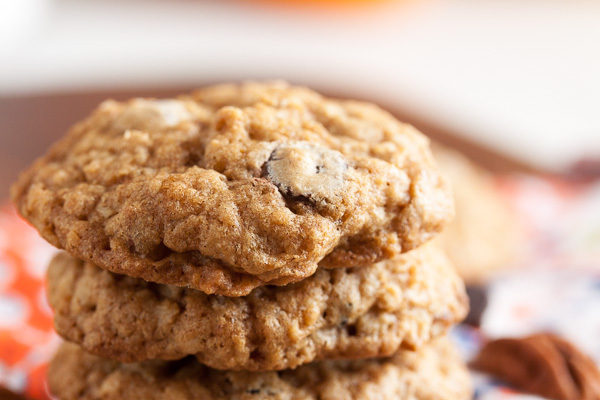 The texture and flavour are both fantastic, and it doesn’t fall apart like some other oatmeal cookies I’ve made. My only complaint as far as cowboy cookie status goes is that they need more chocolate chips. So I’ve increased the quantity in the ingredients for you. You’re welcome. One last note – you may notice that I’ve changed the type colour here slightly to improve readability. I’ve had this site up for several years now and never received any complaints about this, but in the past few days I’ve gotten two separate comments. The first was a very polite email from a lady named Marcia. Hi Marcia! I hope this helps. 🙂 The second was a long, insult- and expletive-filled diatribe from a man named Ted. Guess which one I made the change for? Adapted from Tate's Bake Shop: Baking For Friends, by Kathleen King. 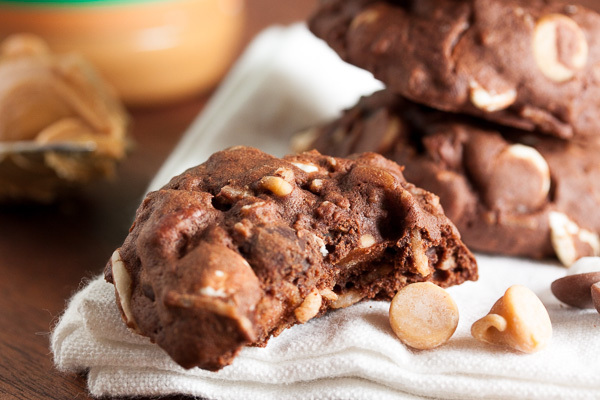 The recipe says it will make about 48 cookies using 2 tablespoons of dough each. I got 70 cookies using my usual slightly larger than tablespoon-sized scoop. In a medium bowl, whisk together the flour, baking soda, baking powder, salt, and rolled oats. Set aside. In the bowl of a stand mixer fitted with the paddle attachment, beat the butter and sugar together on medium speed until light and fluffy, about 3 or 4 minutes. Scrape down the sides of the bowl and add the eggs, one at a time, beating well after each. Add the water and vanilla and beat again to incorporate. Turn the mixer down to low and add the dry ingredients, mixing until just barely combined. 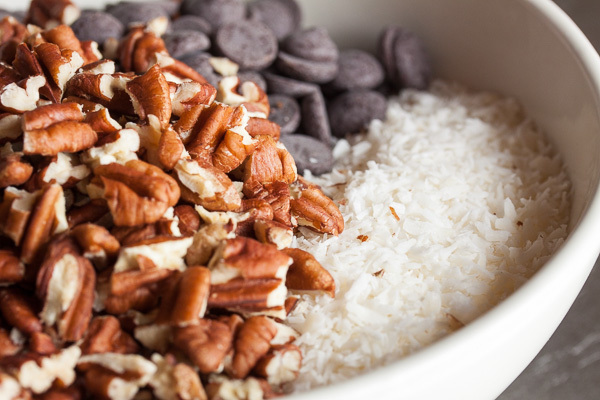 Remove from the mixer and add in the coconut, chocolate chips, and pecans, either with a spatula or by hand. I prefer to knead inclusions in by hand to ensure they're distributed evenly. 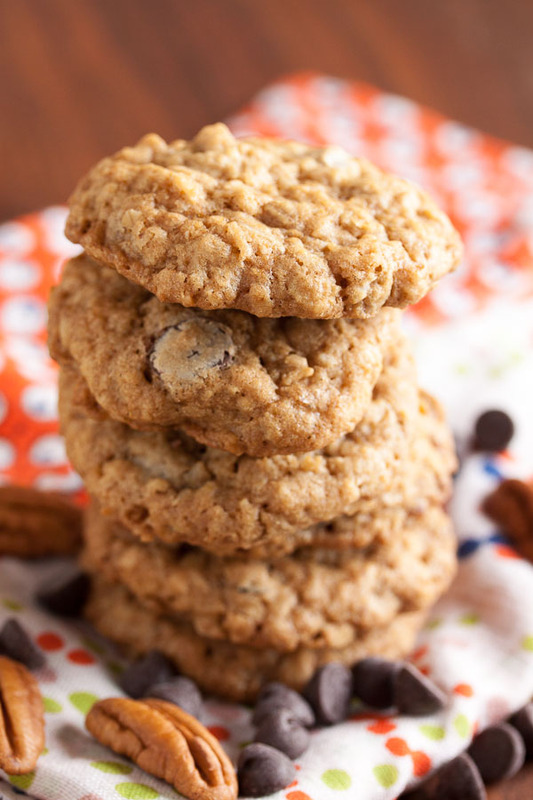 Looks like a good recipe – oatmeal cookies are the hubs favorite so I will be trying it soon. The link for the cookie scoop goes to a 404 message. Guess we’ll be trying that recipe too. Thanks again Sheila! I’m slowly working my way through all of the links, updating that one. Sadly I couldn’t find my preferred scoop on Amazon (I actually can’t find it anywhere online! ), but I’m linking to my 2nd choice. I have a pretty wide selection of scoops. I don’t really have any complaints about the Oxo scoops either. I like that they have the padding on the handle, but the sizes are a bit limited. The scoop I usually use is a #50 (about 1.25 tbsp), and Oxo only makes #20, #40, and #60, so it’s not quiiiiiite what I use. There’s a handy chart here with all the standard scoop sizes. The size # is usually stamped on the swipe-y part (you know what I mean? not sure what it’s called). WOW! 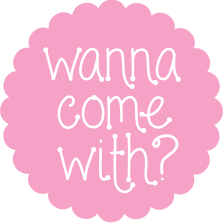 Thanks for the link – what a great resource! I’m going now to explore it.